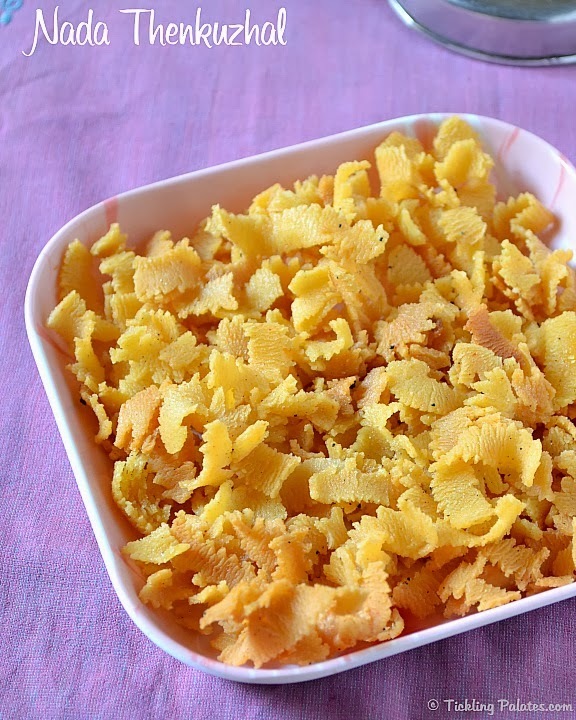 Ribbon Pakoda recipe. This is called by several names like Nada Thenkuzhal, Ottu pakoda, ola pakoda and ribbon murukku and these are made during Diwali festival as a part of the snacks recipes. This crunchy Ribbon Pakoda happens to be my boys favorite. I not only make it during the festival time but sometimes also during the weekends to last for 10 days, as it makes a perfect tea time snack or to munch on whenever you want. I made a batch and took it to my In-laws place for Diwali and came back tried out a variation with the next batch I made for our home as suggested by my SIL and everyone loved it very much. My sister-in-law asked me to add garlic while making these ribbon pakoda and it added a nice punch to the murukku. The addition of garlic not only improves the taste but helps in easy digestion too as these pakodas are made of besan (gram flour), which some find it difficult to digest. 1. Always keep the dough covered with a damp cloth to avoid the pakodas from darkening while deep frying. 2. You can also use garlic powder instead of garlic itself to save time. 3. 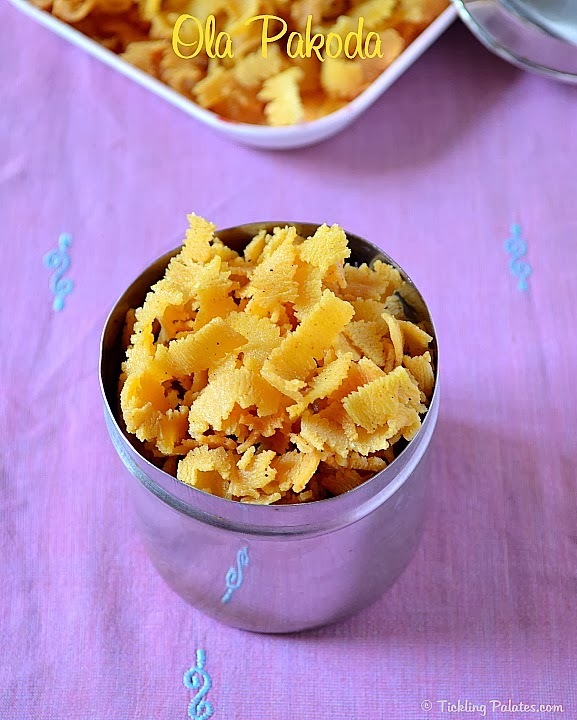 You can also use dry ginger powder (Sukku podi) instead of garlic for another variation. 4. The temperature of the oil should be stable at all the time. 5. Always store savories in an air tight container after they come to the room temperature to retain their crispiness. 6. I have used homemade rice flour, but you can also use store bought Idiyappam flour. 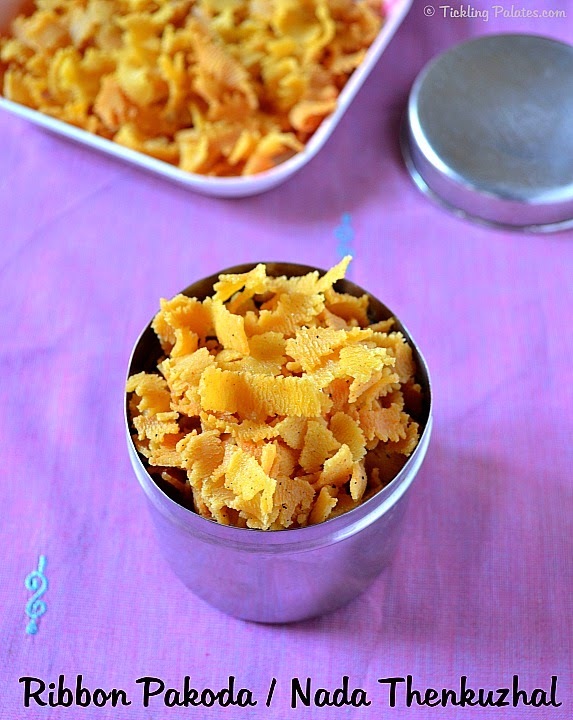 Ribbon Pakoda or Ribbon Murukku that is made as Diwali Snacks. Grind the garlic cloves in a mixer jar with little water to a paste and let the crushed garlic steep in that water for 1/2 hour. Grease the insides of the murukku mould with oil and keep it ready. Heat oil in a deep pan for frying. When hot simmer the flame. In a mixing bowl, mix together rice flour, besan, pottukadalai powder (roasted gram dal flour), red chili powder, asafetida, salt and mix well. Add the ghee and mix with your finger tips till it resembles bread crumbs. Squeeze the garlic and discard it. Add the garlic infused water to the flour mixture and knead into a soft dough. Add more water if necessary. Take pea sized dough, roll into a cylinder and drop into hot oil. If it rises immediately, the temperature is correct. Insert the ribbon pakoda jaali in the mould and fill with dough. Press the dough directly into the oil in a circular motion. Cook over medium flame till the sizzling stops and the ribbon pakoda turns to a golden brown color. Remove over a kitchen paper and let it come to room temperature. My all time and even i too love to have any time in the day.I miss my mom made ribbon pakoda. woww..yummm & crispy..:) You just totally made me hungry! This is my hubby’s favorite .. looks yummy Radhika. Very delicious and crispy looking ribbon pakora. 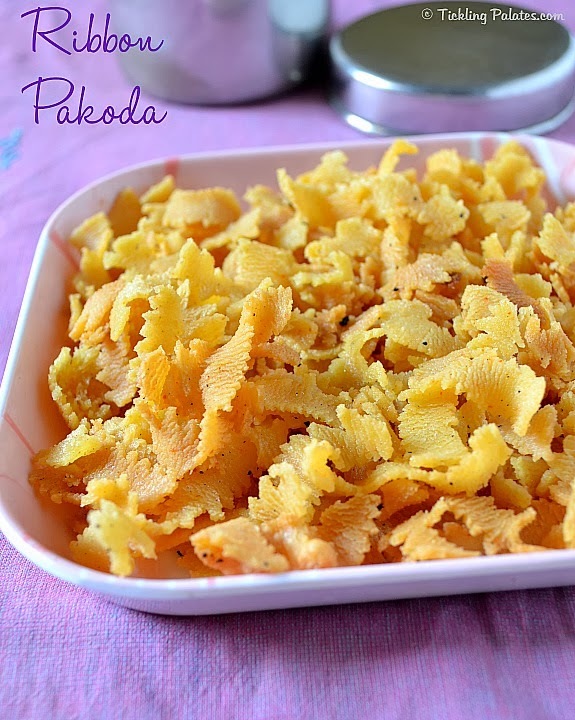 ribbon pakoda looks crispy,my family’s all time fav. Wow…….thay look like original ribbon packing on a gift box………yum………. Crunchy munchy pakodas looks fabulous,feel like munching some..
yes, garlic gives nice flavor and taste to these pakodas…pakodas looks co cripsy n crunchy..your pictures are more sharp n crisp than your pakodas…lovely clicks Radhika! Grandma also makes this way.. adding garlic.. your pakodas are so colorful.. I can totally picture myself munching on this scrummy ribbon pakodas with my evening cuppa chai:)!!! delicious and crispy ribbon pakodas… my favourite as well.. thanks for sharing the recipe..
OMG, good job there..Perfectly fried and looks so crisp ..